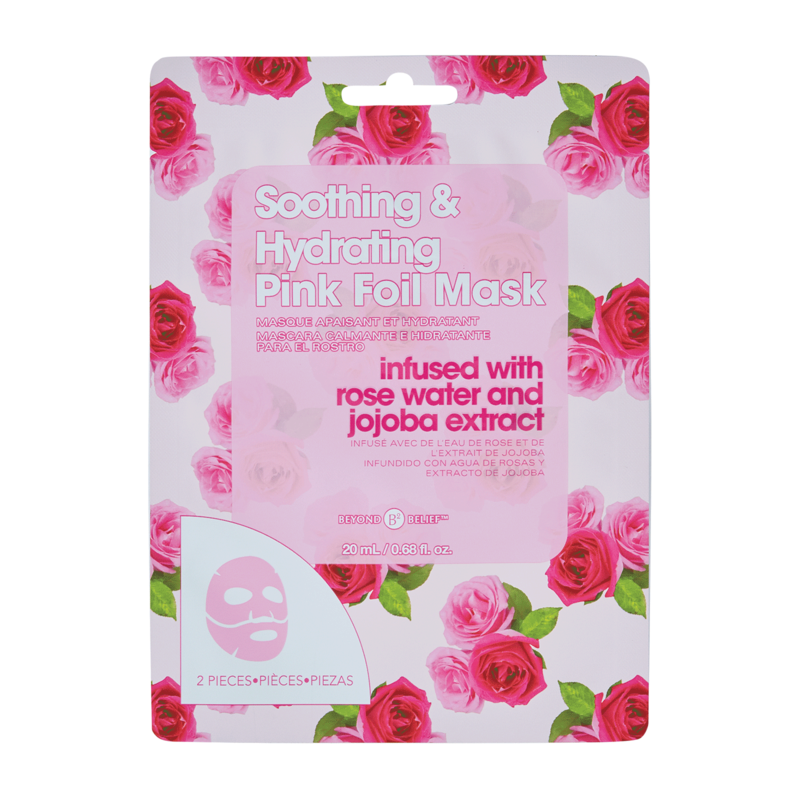 Soothing and Hydrating Pink Foil Mask - Unique foil technology helps keep mask in place. Easy to use 2 piece mask for a customizable fit. Hydrating formula, infused with Rose Water and Jojoba Extract, helps soothe and moisturize for rejuvenated looking skin. After cleaning and drying skin remove mask from packet and gently unfold, removing the film from both layers. Place soft fiber side of lower mask, adjusting the mouth opening to fit. Do the same with the upper mask, adjusting the eye and nose openings to fit. Relax for 15-20 minutes then remove and discard mark. Gently massage any remaining liquid into the skin. For best results, use 2-3 times per week. Water (Aqua,Eau), Glycerin, Phenoxyethanol, Xanthan Gum, Trehalose, Xylitol, Rosa Damascena Flower Water, Caprylyl Glycol, Ethylhexylglycerin, Polysorbate 80, Polyglyceryl-4 Caprate, Zeolite, Allantoin, Sodium Hyaluronate, Simmondsia Chinensis (Jojoba) Seed Extract, Limonene, Scutellaria Baicalensis Root Extract, Amyris Balsamifera Bark Oil, Citrus Aurantium Bergamia (Bergamot) Fruit Oil, Citrus Aurantifolia (Lime) Oil, Citrus Paradisi (Grapefruit) Peel Oil.